A few weeks ago, there was a distinct smell of funky rot in the air, a kind of chaotic desire for everybody to dump their old junk on the curb in order to relive the various cleansing rituals of our ancestors. A similar effect was going on in the league at that point, where the reek of failure was thrown by the wayside as surging squads passed their struggling compatriots, and the playoffs began. Spring cleaning, as it were. Almost a round and a half into things, our perspective is poles apart from where we were, and as we revel in the fresh scent of spring’s flowers and the cool, rubbery feel of newly-borne leaves, once again we are in the position to shrug off the stench of death as vigorous youth finds a way to surpass crackling experience. But sometimes that willingness to let go of failure is a little rough. Just today, we have been treated to an array of different headlines about our favorite (or most hated) sports teams’ struggles, as they lumber on in their ravaged bodies. Across the country from my homestead, fans of the Los Angeles Lakers are eating their breakfast with a yogurt parfait filled with dread as their team looks forward into an assuredly hostile crowd in central Texas. And as their coach appears to be ready to start Shannon Brown Lamar Odom instead of their suspended defensive genius, the press has groaned and lamented the loss of the demolishing force which has wrought two consecutive titles back to the environmentally unsustainable sprawl of southern California. This morning, John Krolik wrote in Off the Dribble about the ineffectiveness of the Lakers’ Pau Gasol against Dirk Nowitzki (and about Pau’s general ineptitude throughout the playoffs). Gasol “looked confused,” the Lakers “simply looked slow” against the likes of Jason Terry and J.J. Barea. Krolik criticizes the Lakers’ dependence on size and aging players, without the irony that comes with how the Mavericks have the oldest lineup in the league, as they play with a larger frontcourt than any of their possible Western conference opponents (Update: Until game 3, apparently). Even the Mavericks’ backup small forward is 6’10”. But why the Lakers will lose against the equally disgusting Mavericks isn’t a matter of the changing of the guard, or the “end of an era,” as Krolik puts it. Both teams are bonded to their dependence on age, size, and outsized contracts. They are both models of “large market” teams. The Lakers aren’t playing the Thunder here. Their weaknesses have been exposed through the simplest of means, and Jackson has been late in correcting his mistakes (like having Gasol attempt to guard Nowitzki, which Sebastian Pruiti exposed as a hilarious farce days ago). It is possible that in Dallas that the dinner table will be cleaned of this Lakers mess, but if Shannon Brown Odom is starting tonight instead of the creepy Matt Barnes, any kind of strangeness is possible. The absence of Artest might mean more than his middling presence. Closer to the “real America,” on Red’s Army, a well-regarded Celtics homer blog, co-founder Chuck asked his minions the following rhetorical question: “Is anybody else fed up with Rondo’s bull-sh*t?” I think that there is some total weirdness afoot in that thought, and how Chuck supports his argument may be equally as strange, comparing Rondo to a woman who is eight months pregnant, amongst a couple other degrading remarks. As well-documented as Rondo’s struggles have been – heck, I probably helped build the “Sad Rondo” meme myself, in my little way – he’s also played a lot better than several other teammates have during these playoffs, e.g. all of last series, regardless if he was able to take advantage of the Knicks’ horrible point guard options. Chuck is right where he says that Rondo is lazily deferring after starting offensive sets, but that’s been a problem for months. Really, the problem is with the matchup with the Heat, where the Celtics are unfortunately undersized, out-hustled, and (cough) jobbed out of the game. It is hard to win when a team can’t get a charge call on a blatant offensive foul, which Heat fans will realize when playing against Derrick Rose in the conference finals. Like blaming Gasol for the Lakers' faults, planting the faults of the Celtics entirely on Rondo's headiness isn't entirely fair. In the same post, Chuck links to an article by Chris Forsberg of ESPN Boston, who taking from the guidelines on NBA Playbook postings, points to video screenshots to indicate where things went wrong in the entirely winnable Game 2. 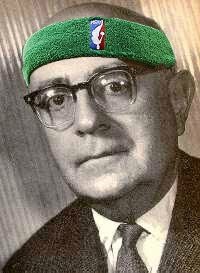 The fault, in those critical moments of decision making, should go to Glen Davis, whose foray into “hero mode” put the Celtics three possessions behind the Heat, whose level heads destroyed the Celtics in transition from those missed shots and put the game out of reach. Out of stubbornness or whatever, Rondo rarely attempts forays into heroics – likely too rarely. Their opponents were just too strong, their ordinarily lackadaisical crowd too robust and full of pride, blind to the cyclical future. Things may change beginning tonight (or tomorrow, when the remains of Shaq are scattered at half court and his ghostly visage appears to haunt the pick-and-rolls of the Heat), but for now, they are bleak for both of last season's finals competitors. We feel crippled by how these teams that have been built in our own halcyon days have begun to wither away, to “go gently into the good night” like the now-ancient teams of our fathers and mothers. For fans of the Celtics and Lakers, this is a more difficult transition than most will carry. Some of us wonder what sort of sports/cultural world that our current or far-off children will inherit, and whether we will be able to raise our children high above our heads to mark the occasion where our team won, where we represented greatness, nobility, perfection in the sport. Sporting aside, this year is a troubling mess already, and it almost seems perfect that this is the season where all of our legends die, to be put on the sidewalks like potted plants that we forgot to water all winter. welcome to the autumn of your life, heat fan!